The Empire, of Drought Mixtapes fame, did a guest blog for our friend Karen Civil today. 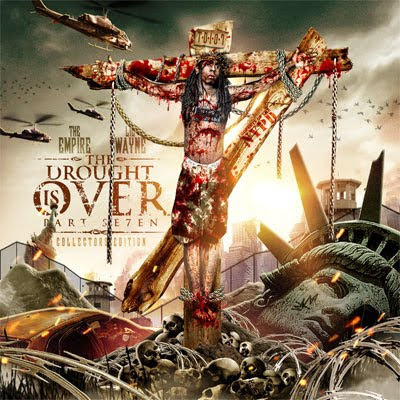 Read what he has to say on the Drought series, Lil Wayne, and the music industry below. Apparently Drought is Over 7 could drop anyday! I think its time to get out of the mixtape game. These days its not even possible to drop a cd without getting a phone call from an artist or label asking why did you put this out or where did you get that from. Where is the excitement of releasing a new record from your favorite artist when I got to worry and hear about lawsuits coming down or RIAA raids for playing an exclusive record. If I decided to call it quits with “The Empire”, I wonder if I will be remembered? Some people credit me with the whole Lil Wayne explosion with my Drought Is Over series. I think that’s what branded me the most. When I look back on it, was I doing something to help or did I just cause problems? I just feel like I took a opportunity that came across to me and jumped on it. I never expected it to get the cult following it has now. In the back of mind I hope that one day, Wayne would have reached out and acknowledged what I did for him and maybe want to do a official project with me, but I don’t think that day will come anytime soon. SO whether its appreciated or not, I still continue to drop exclusives. 2010 is here, and I’m already working on the much awaited drought is over 7, which should be out any day. It’s shaping up to be the best tape yet. For the first time ever, I’ve aligned myself with one of the biggest movements in Atlanta, Duct Tape Ent. My main focus is really helping them to grow. Alley Boy who recently signed to Atlantic Records has a buzz that is growing. Just expect a lot of new innovated stuff coming from me this year. know whats the funniest part? so...why is she still there?